Kill Devil Hills is a town in Dare County, North Carolina. Kids will appreciate attractions like Jockey's Ridge State Park and Nature & Wildlife Tours. You'll find plenty of places to visit near Kill Devil Hills: Corolla (Currituck Beach Lighthouse and Museum & Currituck Beach). Plan for a day of cool, family-friendly fun on the 26th (Wed) at H2OBX Waterpark. The adventure continues: explore the galleries of Wright Brothers National Memorial, take in the waterfront at Duck Town Boardwalk, have some family-friendly fun at Life on a Sandbar, and get a new perspective on things with Boat Tours & Water Sports. To find maps, ratings, photos, and tourist information, read Kill Devil Hills trip planner. Buffalo to Kill Devil Hills is an approximately 6.5-hour combination of flight and car. You can also drive; or do a combination of train, bus, and taxi. Plan for a bit warmer temperatures traveling from Buffalo in June, with highs in Kill Devil Hills at 83°F and lows at 70°F. Wrap up your sightseeing on the 26th (Wed) early enough to drive to Manteo. Manteo is a town in Dare County, North Carolina, United States, located on Roanoke Island. Kick off your visit on the 27th (Thu): visit a coastal fixture at Bodie Island Lighthouse, then meet the residents at North Carolina Aquarium on Roanoke Island, then admire all the interesting features of Island Farm, and finally take a leisurely stroll along Jennette's Pier. Get ready for a full day of sightseeing on the 28th (Fri): find your balance on the water with some of the best stand-up paddleboarding in the area, take a tour by water with Boat Tours & Water Sports, and then get to know the fascinating history of Roanoke Island Festival Park. For other places to visit, ratings, and other tourist information, read our Manteo trip maker . Manteo is just a short distance from Kill Devil Hills. In June, daily temperatures in Manteo can reach 82°F, while at night they dip to 70°F. Wrap up your sightseeing on the 28th (Fri) to allow time to drive to Hatteras Island. Kick off your visit on the 29th (Sat): make a trip to Chicamacomico Life-Saving Station Historic Site & Museum, visit a coastal fixture at Cape Hatteras Lighthouse, and then tour the pleasant surroundings at Frisco Beach. 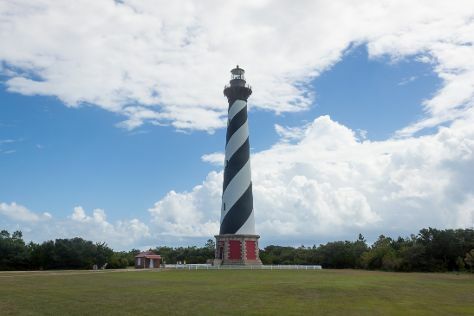 Get ready for a full day of sightseeing on the 30th (Sun): enjoy the sand and surf at Cape Hatteras National Seashore. To see reviews, where to stay, photos, and more tourist information, use the Hatteras Island road trip app . You can drive from Manteo to Hatteras Island in 1.5 hours. In June, plan for daily highs up to 83°F, and evening lows to 71°F. Finish your sightseeing early on the 30th (Sun) so you can travel back home.